Feline acne is a skin disease that is quite common in cats. Some acne cases can be so minor, that it’s easy for cat owners to not even see any symptoms. It is only when the acne clusters get out of control where it becomes very noticeable resulting in your cat consistently scratching themselves and swelling developing in the areas of the acne. Cat acne, especially severe cases, can sometimes be mistaken for other skin conditions such as; ringworms, yeast infection or skin mites. 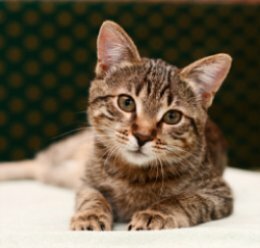 This skin problem mostly affects cats between the ages of 2 and 4, but it can affect cats at any stage of their life. Most causes of cat acne includes an hyperactive sebaceous glands, which secrete oils known as sebum. These oils are important because they prevent your cat's skin from getting dry and irritated, however an overproduction of sebum can lead to your cat’s hair follicles becoming blocked with black sebaceous oil which then results in feline acne. Other factors that can cause acne include stress, a poor diet, poor hygiene, reactions to medication and/or allergens. Plastic cat food bowls have also been connected to feline acne. As a result of plastic bowls trapping bacteria, especially if they are scratched, once your cat drinks from the bowl bacteria from the plastic bowl can easily transmit to your cat’s chin or mouth and cause cat acne. It’s important to use stainless steel, ceramic or glass bowls when serving your cat his or her meals, water or snacks. Feline acne is a cat health problem that can come and go intermittently, remain with your cat for the rest of his or her life, or be a one-time occurrence. Feline acne can sometimes be fairly simple to detect while other times it may present symptoms of other skin diseases, such as ringworms. Acne tends to appear around your cat's mouth or chin area. One characteristic of acne is black discharge around your cat’s lower chin area or their chin may appear to be dirty. Some other signs that may indicate your cat is suffering from acne include abscesses that form crusty clusters after breaking open. Constant itching can lead to red, inflamed skin that could later become infected with bacteria. The acne can lead to secondary bacterial infections because of the swollen welts that can become open sores on your cat’s skin. Cat Acne can also lead to excessive hair loss. Your cat's veterinarian will diagnose cat acne by performing a thorough physical examination of your cat. Skin scraping or skin biopsy may be performed to ensure your cat is not suffering from another condition such as; ringworms or yeast infection. A laboratory test called “culture and sensitivity” may also be necessary if your vet suspects your cat has a secondary bacterial infection. A routine blood test may also be ordered to rule out any other possible diseases that could be causing cat acne as a secondary condition. Although there is no cure for cat acne, the condition can be controlled with several different types of feline acne treatments. Mild cases of acne may not require treatment, especially if there are no symptoms. In mild cases where there are symptoms your vet may recommend daily cleaning of the infected area with an antibiotic soap, which reduces breakouts and a mild topical ointment. If the condition is minor your cat’s vet may recommend waiting to see if the acne resolves itself. For severe cases, your vet may recommend an antiseborrheic shampoo. Most of these shampoos contain benzoyl peroxide, which is used to control excess oil. Cortecosteriods, which are steroids that are sometimes prescribed to treat severe skin problems and allergies in cats, may also be prescribed to help reduce excessive inflammation of your cat's skin. For treatment of secondary bacterial infections, your cat’s vet may recommend antibiotics like mupirocin, which is available in a topical cream or an oral medication. Cat acne is a common and treatable condition. To help prevent acne it's important to make sure your cat is eating the best cat food that is high quality, filled with vitamins and high protein. Making sure to keep your cat's home environment low stress and being an observant pet owner noticing the first signs of symptoms can help to prevent or reduce the severity of cat acne.